Substance consumption by young people remains one of the most widespread and costly problems in Europe. This remains true despite important investments made into education and prevention related to alcohol and drug consumption. It is the first cause of death among young people in the world. Consumption of illicit drugs and alcohol is associated with various hazardous behaviours such as violence, injuries, suicide, depression, school dropouts or risk sexual behaviours. It is a strong factor in substance abuse later at adult age and addiction, particularly among men in most societies. A majority of young men have hazardous behaviours. According to a study directed in Switzerland, near to 70% of 19-year-old-men have hazardous behaviours (i.e. cannabis consumption at least twice a week, daily tobacco consumption or binch drinking at least twice a month). And yet, a majority of young men with hazardous behaviours mature out at adult age. Unfortunately not all of them. 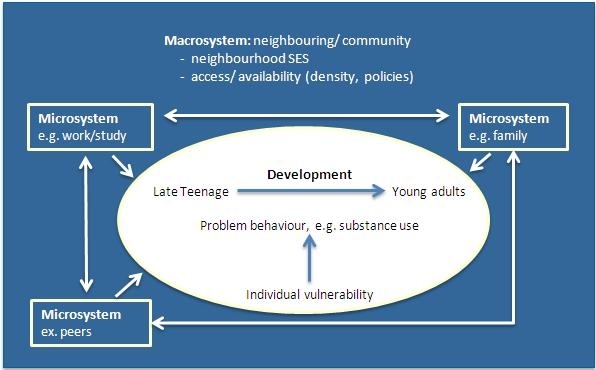 Such behaviours as substance consumption are the result of the interaction and interdependance between behavioural, personal and environmental factors. Environmental and family factors tend to strengthen such behaviours, while personal factors alter the way in which individuals perceive and interact with their environment. What are the tendencies and prevalence in substance consumption? What are their consequencies among young adults in Switzerland? How come that a majority of young adults with risk behaviours come up again, but later, with risk behaviours? What are the risk and protective factors and circumstances that protect from substance abuse and that allow to mature out later in life? In order to reply to such investigations, it is necessary to follow the same persons up to their middle age. Longitudinal studies on substance consumption are rare and costly. Most of them are directed in North America, where youth culture is multiple. Such studies are rare in Europe. C-SURF is the first in Europe, to our knowledge. And yet, Switzerland stands in the head of European countries with regard to substance consumption rates by teenagers. The C>SURF study seeks to follow substance consumption by 19-year-old-young adults during at leat 10 years. These young adults come from all sorts of horizons: they are not all "clean", nor do they all have a low consumption rate. The sample in this study seeks to be the most representative of real life. The C>SURF study concerns young swiss adults who have to go through the mandatory recruitment process at the Swiss army. This process covers 98% of the swiss male 18-year-old-people. It allows our study to cover a maximal range of the male population in Switzerland. Participants in this study receive a financial reward (vouchers), which is interesting considering their age.